The Ford Escape compact crossover SUV is completely redesigned for 2013. Highlights from the long list of changes include two new turbocharged 4-cylinder engines, a new 4-wheel-drive system, Curve Control and Torque Vectoring Control technologies, an available MyFord Touch infotainment system, an optional power liftgate that can be opened by waving a foot under the rear bumper, and extra-cost Active Park Assist, Blind Spot Information, and Cross-Traffic Alert systems. 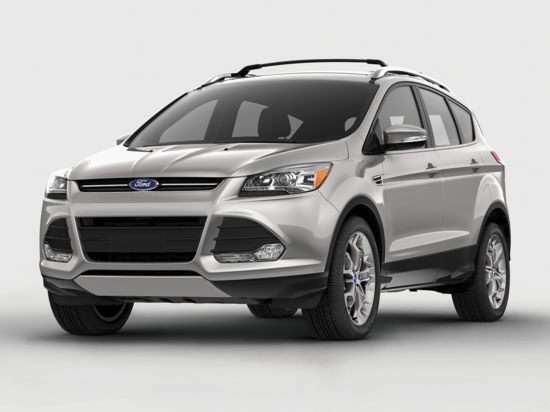 Ford offers the redesigned 2013 Escape in S, SE, SEL, and new Titanium trim levels. Upgrading from S to SE trim adds Sync connectivity, satellite radio, a compass, an outside temperature indicator, automatic headlights, fog lights, and 17-inch aluminum wheels. The Escape SE also includes dark tinted rear glass, a height-adjustable driver’s seat, and upgraded interior and exterior trim. Choose the SEL trim level, and the Escape has MyFord Touch technology, leather seats, heated front seats, a 10-way power driver’s seat, dual-zone automatic climate control, an upgraded sound system, and ambient cabin lighting. Larger 18-inch aluminum wheels, heated exterior mirrors and an auto-dimming rearview mirror are also standard. Titanium models are equipped with HID headlights, a power liftgate, rear parking assist sensors, and 19-inch wheels. Inside, upgraded leather, a premium audio system, keyless access with push-button starting, and remote engine starting. A 168-horsepower, 2.5-liter 4-cylinder engine is standard for the Escape S, driving the front wheels through a standard 6-speed automatic transmission. The Escape SE and SEL are equipped with a turbocharged, 178-horsepower, 1.6-liter EcoBoost 4-cylinder and a 6-speed automatic. Ford’s new Intelligent 4WD system is optional on these two models. The Escape Titanium has a turbocharged, 240-horsepower, 2.0-liter EcoBoost 4-cylinder engine and a 6-speed automatic. Intelligent 4WD is optional, and this engine can be installed in the SE and SEL models as an option. Ford Escape fuel economy ratings range from a low of 20 mpg in the city for the Escape 4WD with the 2.0-liter EcoBoost engine to a high of 33 mpg on the highway for an Escape 2WD with the 1.6-liter EcoBoost engine. In combined driving, all version of the Escape are expected to get between 24 mpg and 26 mpg, according to the EPA. The 2013 Escape receives an overall rating of 4 stars in crash tests conducted by the NHTSA, and is called a “Top Safety Pick” by the Insurance Institute for Highway Safety. MyKey is standard for the 2013 Escape, allowing the SUV’s owner to program specific vehicle features including speed alerts, maximum stereo volume, seat belt reminders, and more. Additionally, the Escape offers a foot-activated power liftgate, a MyFord Touch infotainment system with navigation, and HD Radio with iTunes tagging capability. A reversing camera, front and rear parking assist sensors, and rain-sensing wipers are available, along with a Blind Spot Information and Cross-Traffic Alert system. Active Park Assist steers the Escape into a parallel parking space while the driver operates the transmission and pedals.